Despite a trend towards mixing high and low articles of clothing, there is something to be said about harmony and consistency in place of trendy. This is especially true as we properly usher in Autumn 2014. Soon enough, it will be cool enough for topcoats and hats. While the importance of keeping one's head covered is not debatable, the choices are. Flatcaps, knit hats, driving hats and fedoras are all options utilized by the savvy and just plain freezing. Fashion magazines, who must introduce something new to the readers, dictate that knit hats, for instance, dress down a more formal overcoat. If it comes down to formality versus casual, put me on the formal side, every time. No knit hat, no flatcap, no baseball cap with your overcoat. A proper gentleman's hat to top off the look is in order to achieve adequate harmony. My own hunt truly began years before I'd have to brave frosty elements. Growing up watching the screen stars of the 1950s, the elegance of the fedora atop an immaculately attired Spencer Tracy in Adam's Rib stayed with me. Although hats are not the dominant accessory they were 60 years ago, they're just as dashing today, even more so due to the countless inappropriate and just plain tacky head coverings seen on men with otherwise appropriate outerwear. I had read about JJ Hat Center, a New York institution for over a century, years before I moved here. 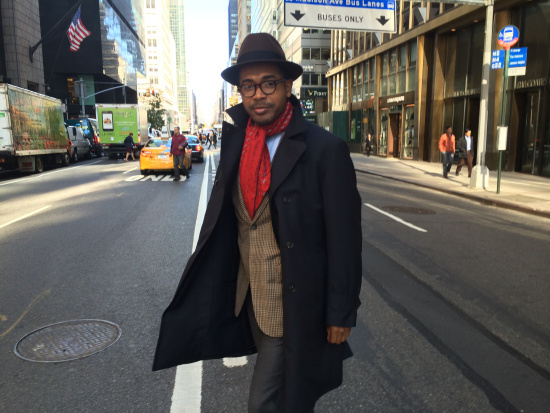 As I'd recently decided on purchasing a hat, I headed to their Fifth Avenue shop. The staff, all enormously knowledgable and passionate, educated me about finding the right brim (sides of the hat) width for my face, the correct crown (the top of the hat) for the shape of my head and the best shade for a first purchase. Blue, brown and grey were the suggestions, which are in line with the rest of menswear articles of clothing, as the most versatile. After trying on several in shades ranging from camel to charcoal, I settled on a deep brown fedora by Selentino. This will top off both my blueish/grey double breasted overcoat and my grey herringbone topcoat for the upcoming winter very nicely. - As per the staff, before buying one, consider your own wardrobe. What will you likely be wearing this with? Does your wardrobe lean towards a casual or formal? - Although there are a plethora of hatsellers online, it's best to visit a shop to try them on if you're a first time buyer or new to a manufacturer. - While shades of deep, bottle green or burgundy may be eye catching, they're also less versatile. It's easy to get caught up in the excitement. Stay (somewhat) grounded. On the brief train ride from midtown Manhattan to Harlem's west side, I took note of my fellow passengers; three knit hats and two baseball caps. Not shockingly, there was not a fedora topped head in the car. However, as I strolled the five blocks from the station to my destination, I scrolled Tumblr, and took note of the contrary. This generation has, in recent years, experienced a resurgent interest in what is considered classic men's clothing, eschewing the one-size-too-slim designer trends of a decade ago or the wave of three-size-too-large everything of the late 1990s. The fedora, that final touch of gentility seems to be gaining popularity among the previously hesitant, due in no small part to links of the generation. The unassuming facade of my destination, Flame Keepers Hat Club, would trick the casual passerby into believing what was on the other side of the wall was just as understated. Aside from muted wooden floors and pale grey brick walls, accented by a lone magenta wall, the shop is resplendent with fedoras in hues of burgundy and hunter green, flap caps in speckled tweeds and herringbone. Walking into the two-month old shop on West 121st Street, I was greeted by its genial proprietor, Marc Williamson, himself a 22-year veteran of New York's JJ Hat Center. Williamson was steaming and brushing a new stock of hats to be soon displayed when I asked what's the response been to his new shop. "It's all been going very well. I will not complain," said Williamson, who at this point had taken the hat I wore into the shop and gave it a brush and steam. Social media has played a significant role in the shop's promotion thus far. Before the Instgram snaps of clients, however, there was a trying, year-long process to find a good enough space for the shop. After a back and forth with building owners, Williamson settled on the location, which sits at the corner of Frederick Douglas Boulevard, among Harlem's major arteries. The area is experiencing what the New York Times described resurgence in development. Williamson, a lifelong New Yorker, by way of Woodside, Queens, felt a particular kinship in Harlem. "It's a great sense of community here," noted Williamson as two locals entered the shop. The two customers, one in a tan Stetson, browsed around the shop, trying on varieties and chatting with the obliging owner about hats. With a necessary style still to come in stock, the gentlemen left, with one shouting from the door that he lives across the street and would return later. "You see," said Williamson, regarding the serendipitous encounter. "We have those discussions about hats all the time." The 'We' Williamson refers to is not entirely the fedora-topped gentleman depicted in the old Apparel Arts illustrations, rather it's everyone from the twenty-something Brooklynite, just getting into his first hat to the octogenarian, lifelong Harlem resident who may have very well observed speeches by Malcolm X or recall the sermons of Adam Clayton Powell, Sr. In that respect lies that idea, the concept, the core mission of Flame Keepers; continuity. "We're passing the torch of good taste from one generation to the next, " said Williamson about the inspiration for the name of the shop. "Good taste is a range of things; it's how your treat people. It's how you present yourself. That's what we're trying to do here." For Williamson, taste transcends any garment, rather it's more abstract. It's spirit, a way of behaving and carrying yourself. Does a hat achieve that? Perhaps not solely, but it's a stylish beginning. Beyond the abstract to the tangible. A hat just looks damned good. There is not a more appropriate way to dress one's head than a proper hat. A knit or baseball cap often looks juvenile when paired with business formal clothing, while a headless pedestrian complete with heavy coat and scarf looks forgetful and cold. Some men may believe they're not the hat-wearing sort but, that must be due to not trying. Visit the shop and Williamson will make suggestions on color, crown shape and brim width, all to best complement the shape of the wearers face.